Yesterday was such an intense, windy, blustery day. The trees were shaking back and forth, and the wind knocked over a banana tree in the gulch. It was not a very strong tree, a spindly tree, but it still took some force to bend it that much. a vine hanging on the tree. We call these Kona winds, the winds that come from the Kona or South side of the Big Island. These blustery, intense winds bring some volcanic air, voggy (volcanic fog) gases to Maui. Sensitive people may experience more headaches, nasal congestion, allergies, sneezing, and general discomfort when the Kona winds are blowing. Normal trade winds are from the other direction, and are generally enjoyable. We've also had some high surf this week, so I imagine that Jaws has been pretty amazing. That's the legendary place of surfers and crazy kite boarders, riding gigantic waves that only happen a few times a year, during the "winter" season. I haven't stopped by this week but was there action on the last day of January and the surf wasn't as huge as it could have been but still pretty big. By the way, Jaws (aka Peahi) is right in Haiku, a few miles from my home. It's easy to spot by driving down Hana Highway around mile marker 14 or so, looking for cars parked on the highway across from Peahi Road. 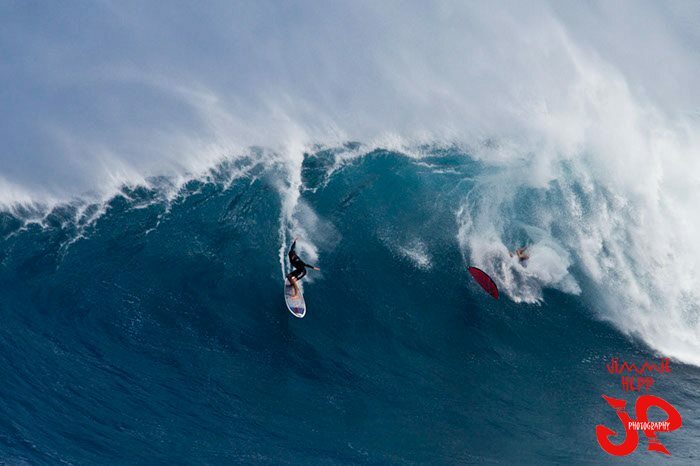 Any time there are high Kona winds and a high surf warning for the North Shore of Maui - find out by checking the weather report, there's a good chance that Jaws is going off. Today has been a rather peaceful day, although quite cool. I spent part of the day hacking at shrubbery and lilikoi vines that had overgrown along the path. The Kona winds had knocked them against the side of the house so they were hanging down too low. Oh, also the internet with Hawaiian Tel has been erratic and slow. Yesterday, the power went out at least three times, although it was not out for that long. With the winds, some cables probably took a beating and earlier today the wifi was crawling. It seems to be doing a lot better right now, which is why I'm posting right now!